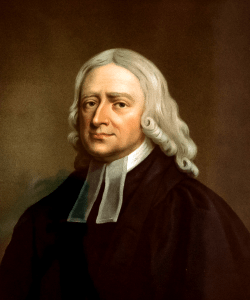 Among Methodist pastors, it seems like everyone has to have a favorite John Wesley story or quote. It doesn’t even seem to matter what kind of theological leanings you have… all the Methodists want to draft Wesley in on their side. On particularly radical occasions, sometimes we go for Wesley more than we go for Jesus… but that’s another story altogether. So what is your favorite Wesley story? There are so many to choose from. His experience of assurance at Aldersgate St. is a very popular one. So is his failed mission to America and his co-creation of the Oxford Holy Club. Some of these put him in a positive light, although many of the most famous Wesley stories emphasized his weakness and struggle with faith. We learn much from not only his mistakes, but more specifically, from the way God worked in his life and changed him. “Wed. 22.—Mr. Delamotte and I, with a guide, set out to walk to the Cowpen. When we had walked two or three hours, our guide told us plainly, he did not know where we were. However, believing it could not be far off, we thought it best to go on. In an hour or two we came to a Cypress Swamp, which lay directly across our way: There was not time to walk back to Savannah before night; so we walked through it, the water being about breast high. By the time we had gone a mile beyond it, we were out of all path; and it being now past sunset, we sat down, intending to make a fire, and to stay there till morning; but finding our tinder wet, we were at a stand. I advised to walk on still; but my companions, being faint and weary, were for lying down, which we accordingly did about six o’clock: The ground was as wet as our clothes, which (it being a sharp frost) were soon froze together; however, I slept till six in the morning. There fell a heavy dew in the night, which covered us over as white as snow. Within an hour after sunrise, we came to a plantation; and in the evening, without any hurt, to Savannah. Tues. 28.—We set out by land with a better guide for Frederica. On Wednesday evening we came to Fort Argyle, on the back of the river Ogeechy. The next afternoon we crossed Cooanoochy river, in a small canoe; our horses swimming by the side of it. We made a fire on the bank, and, notwithstanding the rain, slept quietly till the morning. Sat. Jan. 1, 1737.—Our provisions fell short, our journey being longer than we expected; but having a little barbecued bear’s flesh, (that is, dried in the sun,) we boiled it, and found it wholesome food. The next day we reached Darien, the settlement of the Scotch Highlanders: A sober, industrious, friendly, hospitable people; whose Minister, Mr. M‘Leod, is a serious, resolute, and, I hope, a pious man. On Monday evening we left Darien, and on Wednesday, the 5th, came to Frederica. Most here were, as we expected, cold and heartless: We found not one who retained his first love. O send forth thy light and thy truth, that they may guide them! Let them not yet follow their own imaginations! It is important to know that John Wesley had a tremendous passion to preach the gospel to non-Christians. His whole motive for coming to America was to preach to the Native Americans here, something he only had one or maybe two opportunities to do. As a second choice, he opted to be a traveling evangelist to the many colonies that were stationed in the present day states of Georgia and the Carolinas. The one thing he did not want to do was to stay in Savannah and be a town pastor there (something he would ultimately get in big trouble for and the major cause of his departure from America for good). In this story, he had heard of a village called Frederica that was in need of some spiritual direction. However, there were no cars or smooth roads back then, so traveling between these colonies meant trekking through forrests and swamps. He set out initially before Christmas, but the guide he took got lost and they had to spend the night in the swamp – where he awoke the next morning frozen to the ground. After heading back to Savannah and eventually getting a better guide, he finally made the two-day trek to Frederica. The people were not interested in his preaching or teaching and, although he stayed there several weeks, no one wanted anything to do with him. Finally he left, frustrated and in despair for the community, but happy to put the whole misadventure behind him. It is a favorite story of mine because it reminds me that good intentions do not make good ministry or faithful service to God. Even if I sacrifice my wealth and health, to the point of sleeping outdoors and being frozen to the ground, that will not make for better results. Compared to the revival Wesley experienced himself and then led in England several years after this event, this almost seems like a different person altogether. One of the biggest changes in his life and faith was that he stopped trying to take God into new places and started looking for where God was already at work. I’ve never been one to jump on the latest bandwagon religious fad that comes my way, but I have to admit that there is no mission field that I can go to and get there before God does. God always goes first, and if we keep going back to the very first call He placed on the disciple’s lives “follow me”, we will find that we are not alone sleeping on the frozen ground – God will be right there with us, leading the way. That was John Wesley’s last words. “The best of all is, God with us”. At the very end of his life, which was all as much of an adventure as his holiday trip to Frederica, the thing he remembered last and wanted to pass on to his friends praying around him, was that the best thing of all is, we are not in this alone. What is your favorite story of a Christian servant or teacher? What is your favorite story of your own adventures following Jesus?